For more information about catering please give us a call. 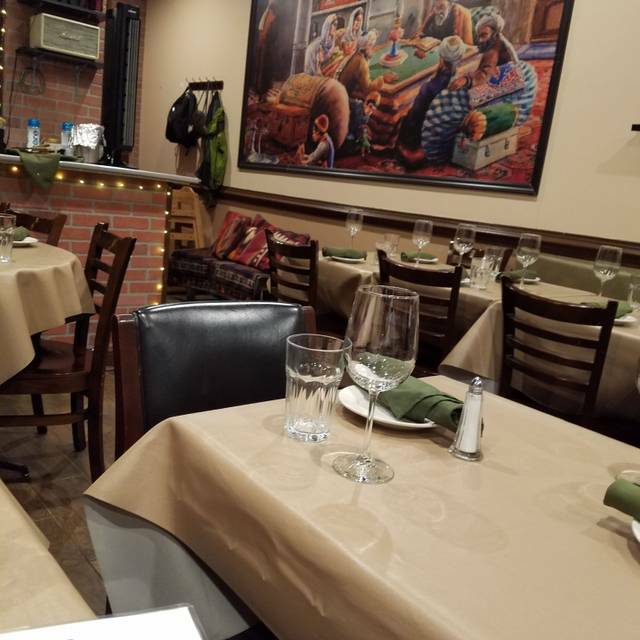 Afghan Bistro, located in Springfield, VA provides guests an authentic Afghan cuisine with a modern flair. Grilled lamb chops (rib and shoulder cuts), lamb tenderloin, and beef tenderloin, served with spicy fresh herb chutney. sweet julienne carrots tossed with fresh lemon juice and garlic. 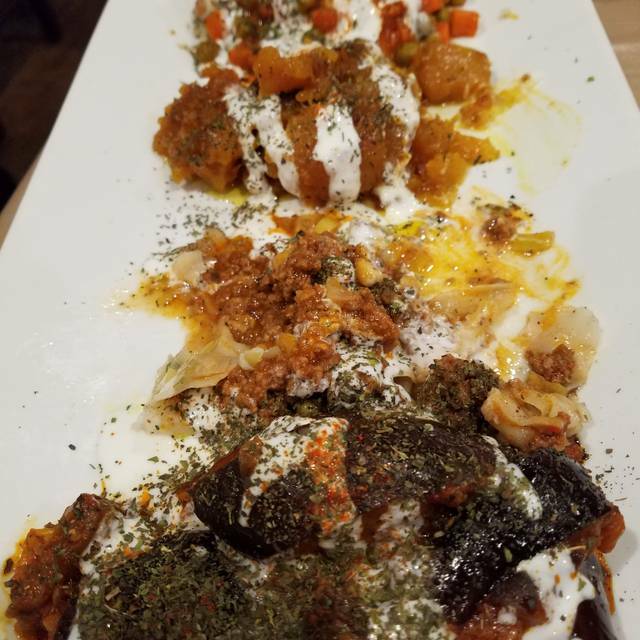 A variety of spicy beef dumplings, roasted butternut squash bouranee, roasted eggplant bouranee, and leek dumpling. Pan-fried to perfection, stuffed with roasted butternut squash, served with yogurt garlic sauce. Tenderloin marinated in our house spices, charbroiled to perfection, and served with yogurt with cucumber & dill. steamed and topped off with a flavorful kofta paashaan (minced beef and lentil korma.) Finished off with mint and yogurt puree. 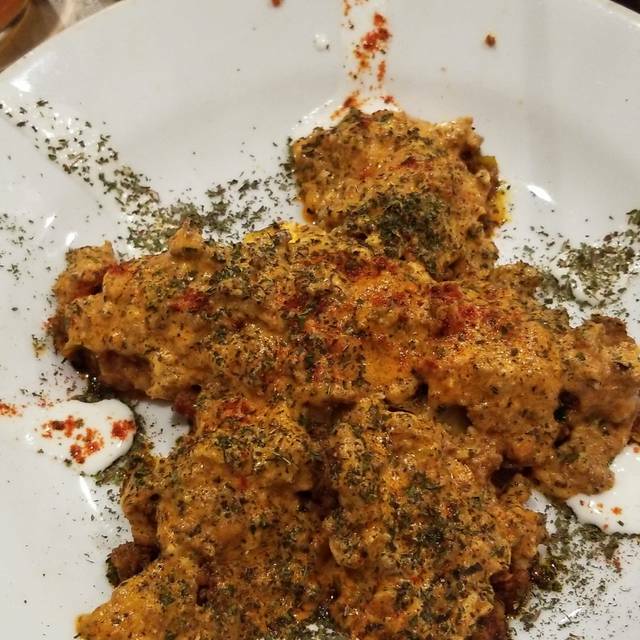 traditional afghan dish consists of toasted afghan bread, topped with a warm yogurt puree infused with garlic and topped off with minced beef and walnut sauce finished with crispy onions. Grilled Lamb Chop, Beef Tenderloin, Salmon and Seekh Kabob served with toasted Afghan bread and Avocado Chutney. sautéed to perfection, stuffed with potato and leek, served with an avocado chutney. Flavored with bistro spices, steamed to perfection, finished off with your choice of yogurt garlic sauce OR minced beef, topped off with crushed dry mint and cayenne pepper. served with a side of bread topped off with a rich demi-glace, infused with special seasoning, finished off with a mint yogurt puree. A cold meze made with garlic and yogurt puree served on top of a crostini. Pan-fried to perfection, stuffed with a combination of spinach ,kale, collard greens, mustard greens, turnip leaves, and cilantro, served with avocado chutney. Pan-fried turnovers stuffed with minced beef and lentils, topped off with powdered sugar and ground cardamom. One succulent Ground Beef Kabob served with Yogurt and dill. minced beef flavored with bistro spices. Steamed to perfection with a carrot and peas qorma, finished off with a yogurt garlic sauce and topped off with crushed dry mint and cayenne pepper. Mediterranean yogurt with fresh dill and cucumber. Combination of mixed greens tossed in a sweet and tangy balsamic vinaigrette served with bleu cheese, and walnuts. combination of mixed greens tossed in a sweet and tangy balsamic vinaigrette served with garlic croutons. mirepoix of fresh tomatoes, onions, bell peppers, cucumbers, and cilantro, tossed with lemon juice and blended together with plain yogurt. our signature ground-beef burger is marinated with fresh herbs and spices, charbroiled to perfection. marinated charbroiled minced beef topped off with mixed greens and wrapped in lavash bread. marinated chicken topped off with mixed greens and wrapped in lavash bread. marinated charbroiled salmon topped off with mixed greens and wrapped in lavash bread. spinach, kale, mustard greens, turnip leaves, collard greens and fresh herbs. Slow cooked with beef, served with saffron infused basmati rice. steamed to perfection, topped with a flavorful kofta paashaan (minced beef and lentil qorma). Finished off with mint and yogurt puree. 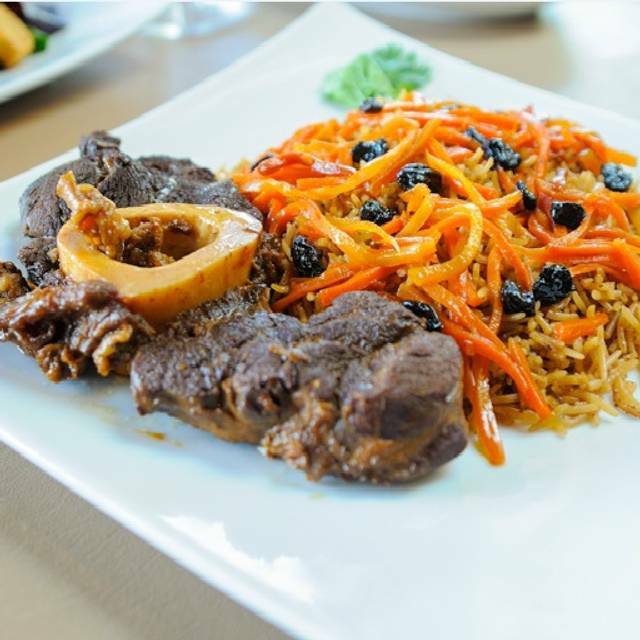 beef shank slowly braised then baked with long grains of basmati rice infused in house spices. Topped off with raisin and julienne carrots. beef shank slowly braised with lentils, chick peas, and fresh dill. Shoulder chops, rib chops, and tenderloin served with long grain seasoned basmati rice, topped off with julienne carrots and raisins, accompanied by a side of roasted eggplant. chunks of tenderloin marinated overnight in our special bistro spices and herbs, charbroiled to perfection, served with a portion of seasoned long grain fragranted basmati rice. Skewer of tenderloin kabob & skewer of chicken kabob served with long grain Basmati palou, salate, avocado chutney, potato bouraanee & fresh Afghan bread. 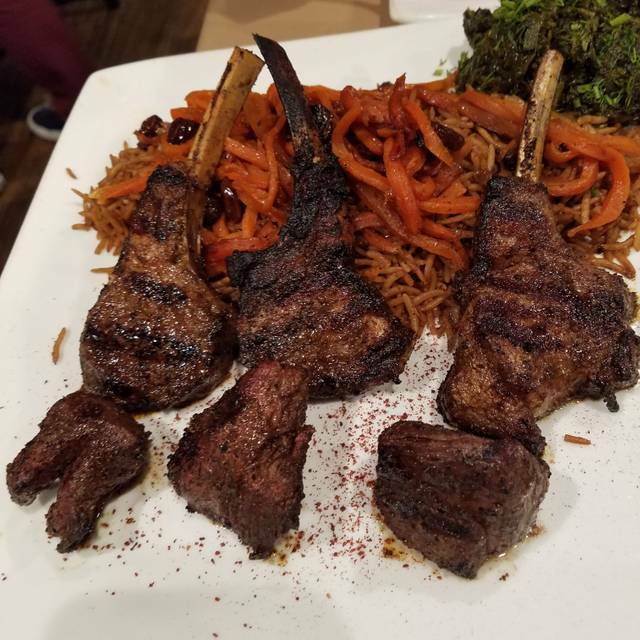 New Zealand French rack of lambs including a skewer of Tenderloin Kabob served with your choice of Palou or Qabuli, served with Salate, Avocado Chutney, Hot Afghan Bread, and Butternut Squash. Skewer of boneless chicken thigh kabob, served with long grained basmati rice (Chalou), salate, avocado chutney, Afghan bread and sautéed potato bouraanee. chunks of chicken breast marinated overnight in our special bistro spices charbroiled to perfection served with a saffron long grain basmati rice. skewer of chicken Kabob & skewer of seekh kabob served with long grain basmati rice, salate, avocado chutney, and fresh afghan bread with potato bouranee. 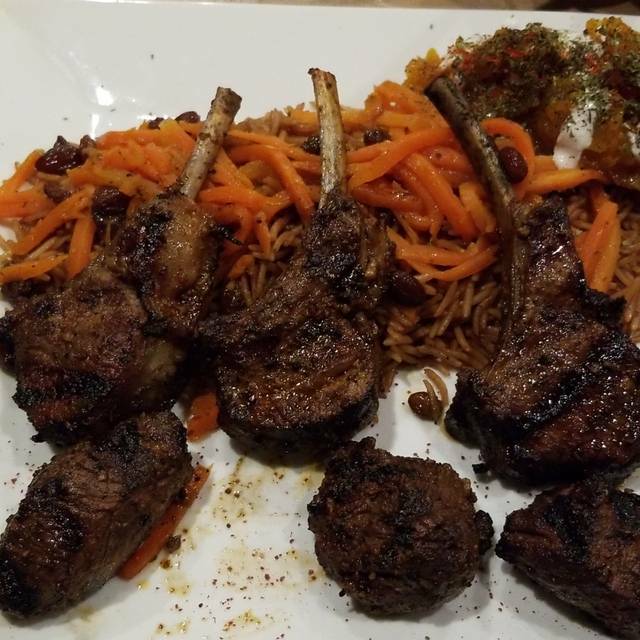 succulent rack of lambs, marinated overnight in our special bistro spices, charbroiled to perfection, served with seasoned long grain fragranted basmati rice. marinated overnight in our special bistro spices and herbs charbroiled to perfection served with a saffron long grain basmati rice. Combination of two frenched rack rib chops and shoulder chops, marinated in our house spices, served with seasoned basmati rice topped off with julienne carrots and raisins, served with a side of roasted eggplant. Marinated in our special bistro spices, charbroiled to perfection, served with a portion of seasoned long grain basmati rice topped off with julienne carrots and raisins. Skewer of lamb and beef tenderloin marinated in our house spices, served with long grain seasoned basmati rice topped off with juilenne carrots and raisins, accompanied by a side of roasted eggplant. Chunks of tenderloin marinated in our bistro spices, charbroiled to perfection, served with seasoned long grain basmati rice topped off with juilenne carrots acommpanied by roasted eggplant. chunks of salmon marinated overnight in our special bistro spices and herbs, charbroiled to perfection served with a saffron infused long grain basmati rice. Skewer of salmon and skewer of Tenderloin Kabob served with combination of white Chalou and seasoned fragrant brown basmati Palou. Served with hot Afghan bread, salate, avocado chutney and your choice of Butternut Squash or Eggplant Bouraanee. roasted eggplant served with long grained saffron infused basmati rice. Roasted eggplant slowly cooked in a spicy tomato based stew, served alongside long grain saffron basmati rice. Roasted eggplant slowly cooked in a tomato based stew mixed with Garam Masala, served with long grain saffron basmati rice. potato korma served with long grained saffron infused basmati rice. Potato qorma and mushrooms slowly cooked in a yogurt based stew infused with garlic, served with long grain saffron basmati rice. Potato qorma, mushrooms, and our slow cooked greens stewed in a yogurt based sauce infused with garlic. Served alongside with long grain saffron basmati rice. stewed butternut squash served with long grained saffron basmati rice. Steamed to perfection, topped off with a carrot and peas qorma. Finished off with a yogurt garlic puree, dry mint and cayenne pepper. sabzi, kadoo, baadenjaan, and kachaloo served with a fragrant spice infused long grain basmati rice topped off julienne carrots and raisins. slow cooked spinach, kale, mustard greens, turnip leaves, collard greens, and fresh herbs. Served with baked long grained saffron basmati rice. Spinach, kale, mustard greens, turnip leaves, collard greens, and herbs slow cooked in yogurt based stew infused with garlic. Served alongside long grain saffron basmati rice. Spinach, kale, mustard greens, turnip leaves, collard greens, and herbs slowly cooked in a tomato based stew. Served alongside long grain saffron basmati rice. Rissotto cooked with chick peas, lentils, and mung beans then infused with fresh dill served with eggplant and butternut squash bouraanee. Boneless chicken slowly cooked in a yogurt based stew infused with garlic and cilantro. Served alongside long grain saffron basmati rice. Boneless chicken and slowly cooked greens, blended together in a yogurt based stew. Boneless chicken slowly cooked in a yogurt based stew infused with garlic, basil and fresh tomatoes. Boneless chicken and roasted eggplant slowly cooked together in a spicy tomato based stew. Boneless chicken and roasted eggplant slowly cooked in a tomato based stew infused with Garam Masala. Bone-in lamb shank and roasted eggplant slowly cooked together in a spicy tomato based stew infused with garam masala. Bone-in lamb shank and mixed greens slowly cooked together in a spicy tomato based stew infused with garam masala. Boneless chicken slowly cooked in a sweet and spicy tomato based stew. Boneless chicken slowly cooked in a yogurt based stew infused with saffron, lemon, and dill. Boneless veal slowly cooked in a yogurt based stew infused with garlic and cilantro. Boneless veal slowly cooked in a yogurt based stew infused with garlic, mushrooms, and cilantro. Slowly cooked alongside mushrooms and mixed greens in a yogurt based stew infused with garlic and cilantro. Slowly cooked boneless veal in a yogurt based stew infused with garlic, basil, and fresh tomatoes. Boneless veal sitting on a bed of our potato qorma, topped off with a yogurt demi-glace. Boneless veal and roasted eggplant slowly cooked in a spicy tomato based stew. Boneless veal and roasted eggplant slowly cooked together in a tomato based stew infused with garam masala. sweet pastry made with layers of filo, topped with chopped nuts and cardamon. Freshly crushed cardamom sprinkled on top of vanilla flavored ice cream. afghan pudding infused with cardamom and topped off with crushed pistachios. 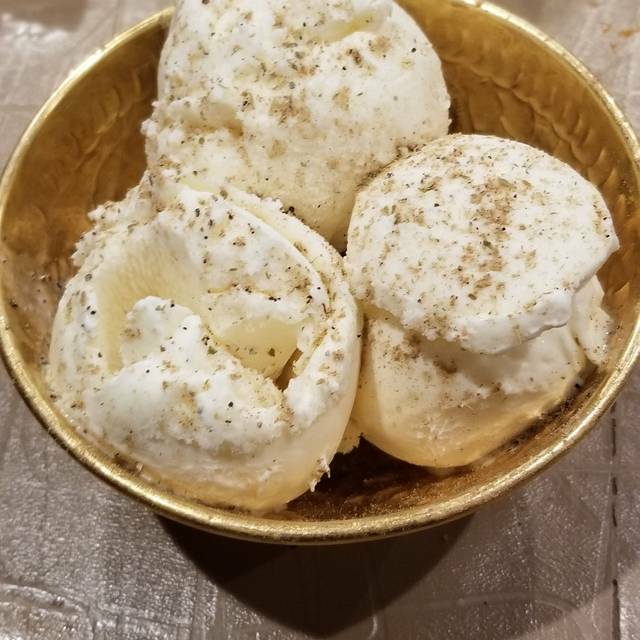 Vanilla flavored ice cream topped off with freshly crushed cardamom and rose water. afghan rice pudding infused with cardamom and topped off with crushed pistachios. One of the best restaurant of my whole life, and I am a foodie. The rich flavors were amazing. Always excellent. Bring out of town friends here often to unanimous positive feedback. Keep up the consistently good work ... and food! Today, I invited my co-worker and his wife to try my most favorite restaurant. And, once again, we all have a most enjoyable meal. Kudos to the owner Omar and his Springfield manager Weiss for continuing to maintain high quality food and great service. Every time we come we are always treated like we are family. We are always well taken care of and the food is incredible. We are grateful for the warm welcome we receive when we go there. center Location south of Springfield on a busy highway. But we will definitely return- a treasure of flavor. EXCELLENT FOOD, EXCELLENT SERVICE, SMALL, INTIMATE, 5 STAR FOR SURE. THE FIRST TIME I CAME HERE WAS WITH MY SON FOR LUNCH AND COULD NOT HAVE ENJOYED IT MORE AND I HAVE BEEN EAGER TO RETURN. THE FIRST TIME I TRIED TO RETURN THE RESTAURANT WAS CLOSED DOWN. I'M NOT SURE WHY IT HAD CLOSED AND FOR HOW LONG IT WAS CLOSED BUT THEN HAPPENED TO NOTICE THAT IT HAD REOPENED AND LEARNED THAT ANOTHER LOCATION IN DC WAS DUE TO OPEN SOON. WHEN FAMILY CAME TO TOWN AND TO CELEBRATE MY SONS BIRTHDAY A GROUP OF US WENT. I WAS GREATLY ANTICIPATING MY RETURN AND THE CHANCE TO SHOW OFF THIS GEM TO FIVE PEOPLE WHO HAD NEVER BEEN THERE. UNFORTUNATELY THINGS WERE JUST NOT QUITE THE SAME FOR ME. THE FIVE WHO HAD NEVER BEEN THERE ENJOYED THERE MEALS VERY MUCH BUT FOR ME THE MEAL WAS NOT AS MEMORABLE AS THE FIRST TIME. MAYBE IT HAD TO DO WITH THE NEW LOCATION IN DC BEING OPEN REQUIRING THE OWNER AND CHEF TO BE THERE. DON'T GET ME WRONG, IT WAS STILL VERY GOOD JUST LACKING THE PERFECTION OF MY FIRST VISIT. THE NEXT VISIT ON A SATURDAY NIGHT WILL BE TO THE DC LOCATION TO SEE HOW IT STACKS UP. The food was excellent and the staff was very attentive to our needs. 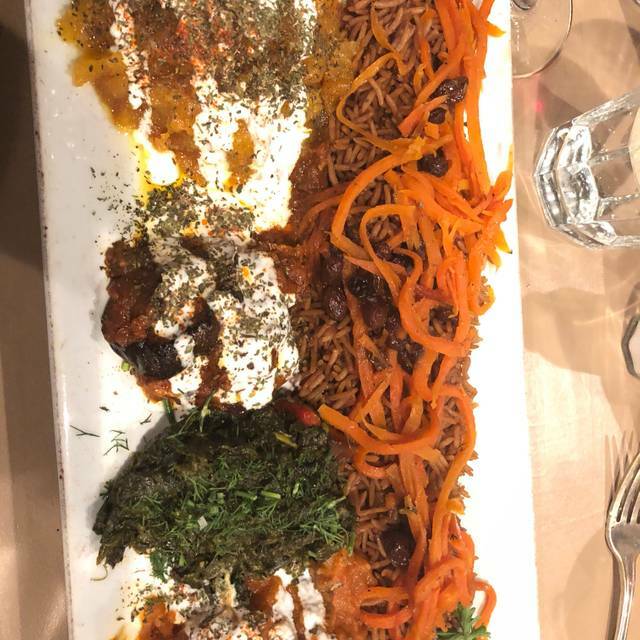 The staff was very familiar with the menu offerings and were able to help with suggesting dishes to try for those unfamiliar with Afghan cuisine. The portions even for lunch are quite sizable for the cost. We even had leftovers to eat the next day along with a sampling of dessert we took to go. Came here with my boss, service and food were great. We celebrated a retirement and the food and service was wonderful. Outstanding! Food is great and all the servers are really attentive and nice. I would like to try all the foods there! It’s lovely environment. I highly recommend it to everyone. My only complaint is the guests need to be checked more often but it didn’t happen! We had a great dinner! We have never had Afghan food before and were very impressed! Our waiter was very attentive and friendly! Would highly recommend! As always, the experience at Afghan Bistro is top notch. The food is amazing and the staff is very friendly. We love it there. The food and service at Afghan Bistro is consistently excellent. This is one of my favorite restaurants. I’ve been there numerous times with different groups of friends. I love trying different items on their menu and so far, everything’s been terrific. Everyone I’ve taken loves it. What a quaint little spot. I loved the intimacy of the place. The food was delicious and the staff was exceptional. I will definitely be going back. Never a disappointment; we try to make it here every few weeks to satiate our cravings for their cooking. Everything is fantastic, from the perfectly made flat bread and accompanying spreads to delicious entrees to cardamon tea to scrumptious desserts. The spinach and roasted eggplant sides are superb. We've had various veal and oxtail dishes, as well as the salmon and vegetarian entrees, and they're all superb. Perfect blend of spices and cooked to mouth-watering deliciousness. The staff and host are always super friendly. All in all, a first rate dining experience. This was my second visit and they exceeded my expectations. They are friendly, helpful and have fantastic food and desserts! It’s a go to place for my girls night out. It was a group of 6 going for a birthday lunch. We had all ordered our foods, in which 3 double appetizers came out for 3 people. The other 3 had ordered entrees. The entrees didn’t show up to our table for AN HOUR. When we had asked one of the workers what was up, she just kept telling us she’d go back and check to see the status but never actually came back to tell us what was wrong. It certainly does not take a full hour to make three kabobs entrees with rice. We knew something was up when tables that had gone in after us got their food first!!!! The owner himself was not there at this time... and I’m sure would’ve taken care of the situation... awful customer service from workers. At least inform your customers if something is up with food. The lady and man servers on March 14 for dinner posses very pleasing personalities. Very nice dinner. We keep coming back to Afghan Bistro because of the excellent food and the wonderful people. We had reservations at 5:30 and were seated; the restaurant filled quickly, small quaint dining area. Great menu choices, serve warm flat bread, with 4 dipping sauces, hot red, mango chutney (little spicy), avocado cilantro and jalapeño. Also brought two bottles of ice water. An ok wine menu. Fantastic choice of appetizers- tried the spicy beef dumplings, it was topped off with tomatoes and small dry cooked peas. Menu described it a little differently. Also tried the Lentil soup, it was brought to table scorching hot, had to wait but it was worth it. For dinner I had the lamb shank moghuli - it was to die for, tender lamb off the bone with a tomato based thickened sauce, egg plant and tiny rice. Other dinners were chicken kabobs cooked to perfection and chicken lawman, tender to the bite. Family gathering at a GREAT restaurant. Our servers were welcoming, warm and engaging - attentive without being intrusive. The food was wonderfully spiced, beautifully presented and served hot! I wanted to try more menu items than I had room to eat, so several return trips will be in order! All around delightful experience. The food was amazing, it was served nice and hot. I ordered the chicken kabob and it was really juicy. The only thing I didn’t like, the windows were completely blacked out. We went for lunch, I would have liked to see outside. I understand if you don’t want anybody to look in but you should be able to look out. Other than that it was amazing I will go back again. We had a wonderful meal for five - everything was fantastic. We will be back! Fantastic meal and excellent, courteous service. For the price of the meals, I expected a little nicer surroundings, but hopefully they are considering that for the future. Will definitely be back, even if it is just for carryout! First time but won't be the last time. Fantastic, flavorful, served hot and with a smile! Loved it there! Always excellent! I’m working my way through the excellent menu! I invited 3 girlfriends for a late lunch that had not been before. They were shocked at this cozy fine dining feel and all were planning to bring family soon. Great place for us to catch up and enjoy amazing food. 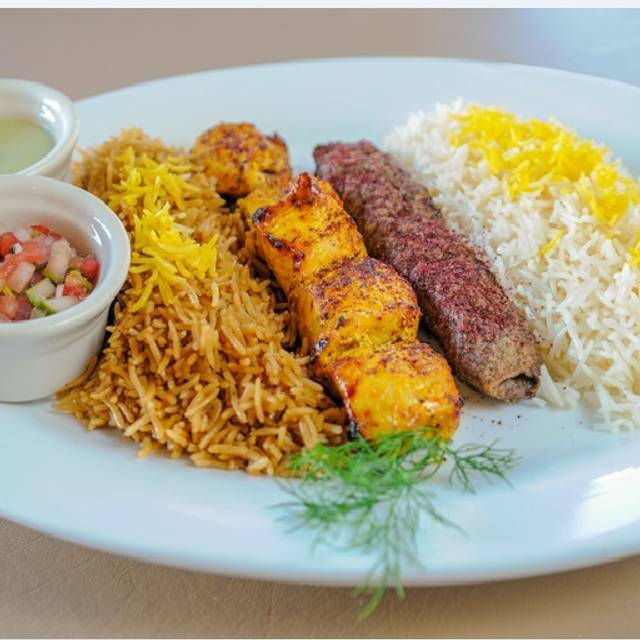 The best Afghan restaurant in the Springfield area is the Afghan Bistro. As someone who has visited Afghanistan as a tourist when being one was possible, I think the cuisine here is the most authentic. Do make a reservation, because not finding a table there is catastrophic! Thank you for being nearby. Great food, service exceptional. Just remember to make a reservation! The food and service was excellent as usual. The dining area was crowded but not overwhelming. Our out of town guest loved it! Hidden gem, once you get past the blacked out storefront. Friendly, helpful staff; great food; reasonably priced. Vegetarian and non, there’s something to please all pallets; dishes deliciously spiced and packed with flavor. Outstanding food and service all around. As always, the arshat, lamb tenderloin special, and cardamon ice cream were outstanding! !